The e-tron full-electric crossover is capable of both AC and DC charging. Audi hopes the 400-plus-km (248 mile) range of its new e-tron electric crossover and the vehicle's reproducible acceleration will entice customers to switch to a zero-emissions car. At 79,900 euros, the e-tron is Audi's second most expensive SUV after the SQ7 (which starts at about 110,000 euros). The e-tron's dimensions – 4901mm long, 1935mm wide – place it closer to the sportier, slightly more compact Q8. Audi executives believe the price point, roominess and range enable customers to make the e-tron their primary vehicle. "The e-tron marks the beginning of a new era of electric mobility for all of us at Audi, it is the first of many to come," Audi interim CEO Bram Schot said at the crossover's unveiling in San Francisco last month. An elaborate system of state-of-the-art aerodynamics, extensive thermal management and an energy recuperation strategy improve the efficiency and longevity of the e-tron's 95 kilowatt-hour lithium ion battery. For an additional 1,540 euros, the e-tron can be ordered with sleek cameras instead of side mirrors, the first car offered in Europe with this feature. By significantly reducing drag, it alone is enough to extend the e-tron's range by between 1 percent and 1.5 percent depending on speed. The vehicle is equipped with two asynchronous electric motors supplied by Audi's powertrain plant in Gyor, Hungary. Together the electric motors can supply 265 kW (355 hp) in normal operation and provide a further 35 kW in "boost" mode. This can propel the vehicle from 0-100 kph (62 mph) in as little as 5.7 seconds. Top speed is limited to 200 kph (124 mph). When decelerating, however, the motors then serve as generators, replenishing the battery. Extensive cooling conduits built around the battery pack, electric motor and power electronics ensure that an optimal temperature of the key systems is maintained. This means that the 5.7 second sprint to 100 kph can be repeatedly achieved, a feature not common in all battery-powered vehicles, Audi claims. Often an expensive optional feature in many cars, air springs come standard in the e-tron. In addition to giving greater ground clearance when driving off road, the real benefit for customers is that the suspension can be adjusted to lower the vehicle's ride height at high speeds to further minimize air resistance and lengthen its range. Audi also installed a pump to redirect waste heat from the drivetrain to the interior, a plus for customers in northern European countries where chilly temperatures can quickly drain a battery. "During winter you can drive our vehicle normally without a considerable reduction in range, whereas in several other competitor models we tested you often have to wear a coat because they don’t have a heat pump," Ulrich Widmann, Audi's deputy head of technical development, told Automotive News Europe. "With this vehicle you have a real range advantage in colder climates where you need to use a lot of energy to warm up the interior." Once the battery is depleted, Audi wants to make it as easy as possible and as fast as possible for customers to recharge the powerplant. No other electric vehicle currently on the market can recharge with a maximum 150 kilowatts output, reducing the time needed to just 30 minutes versus 40 minutes or more for other cars. When accessing public charging points, owners also do not have to bother with a confusing array of billing systems used by more than 1,000 different companies across Europe. Audi settles the transactions for customers as part of its e-tron Charging Service honored by more than 72,000 charge points in the region covering 90 percent of the overall network. "You have one contract with Audi, you get your monthly bill no matter at what operator you are charging. You get it all with this one card and this one app by Audi," said Anno Mertens, Audi's product manager for charging infrastructure.. Since each axle has its own motor, the e-tron has standard all-wheel drive. While a conventional Audi with its quattro awd requires a mechanical clutch, the e-tron's awd system only requires about 30 milliseconds to precisely adjust the torque distribution since the system is entirely electric. The 700-kilogram battery pack, assembled at the e-tron's plant in Brussels, Belgium, is comprised of 432 pouch cells supplied by LG Chem, each rated at 60 ampere-hours. The pack is bolted to the body structure at nearly three dozen different points to heighten torsional rigidity, improving handling and acoustic comfort. To improve aerodynamics Audi will offer the e-tron with optional virtual exterior mirrors. Fast charging: The e-tron is capable of being recharged using 150 kilowatts of power. This allows the crossover to profit from plans by automaker-backed firm Ionity to build up an infrastructure of 400 stations along European highways, each with 6 charging points on average, by 2020. Electric motors: To reduce costs, the e-tron's electric motors do not use expensive rare earth metals. The aluminum-infused rotor, which can reach up to 13,300 revolutions per minute, is lightweight and requires little maintenance. 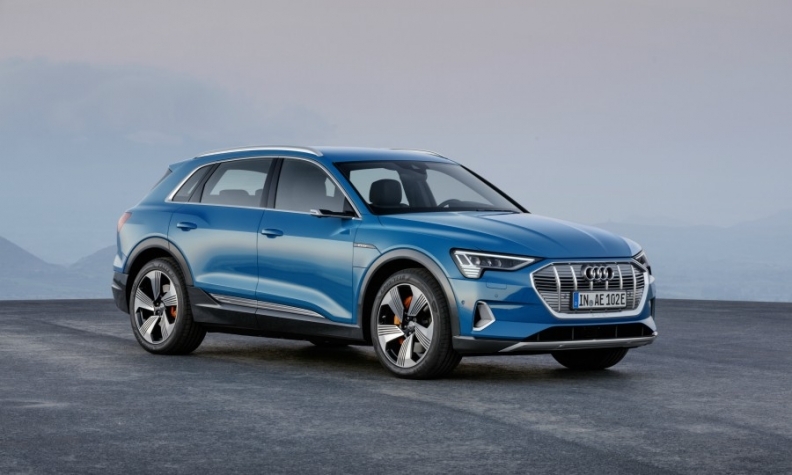 Market launch: At the e-tron's reveal last month, Audi executives said the company had received about 10,000 orders for the crossover. Audi expects European deliveries to start by year-end. U.S. deliveries will begin in the second quarter of 2019. Virtual mirrors: Side cameras project a magnified view of surrounding traffic onto organic light emitting diode (OLED) panels on each front door. The e-tron is the first Audi to use the display technology. 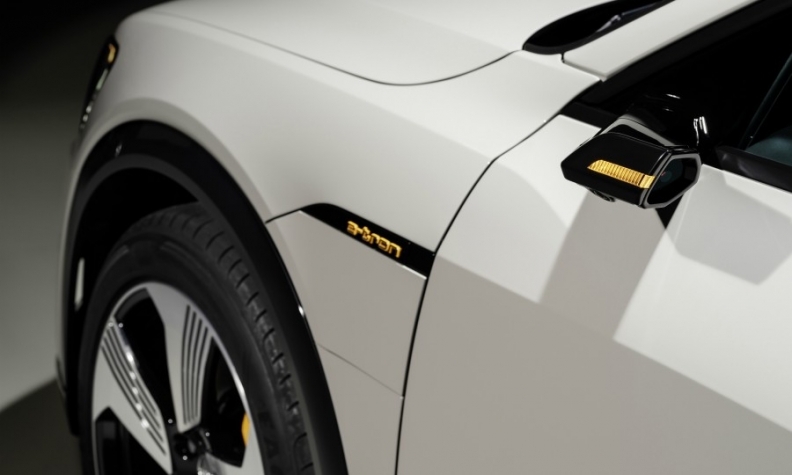 The slim side cameras help reduce the e-tron's the drag coefficient to 0.274 from 0.279.